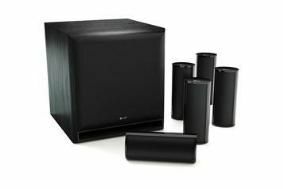 KEF introduces new KHT1505 sub/sat speaker system | What Hi-Fi? Its slim, compact design is intended to match flatscreen TVs and provide 5.1 surround sound from its five satellite speakers and subwoofer. Each satellite speaker has KEF's 19mm tweeter and 50cm low frequency driver, which the company says can easily be driven by virtually any multichannel amplifier. The satellites can be vertically or horizontally mounted on a wall, or placed on the optional HTS1001.2 stands. The subwoofer has a 200W Class-D amplifier, and a 20cm front-firing bass driver. The KEF KHT1505 speakers are finished in gloss black, while the sub comes in black ash veneer.